Photo: BNP candidates Rony and Milton celebrate as they get clearance for polls on Thursday, December 6, 2018. 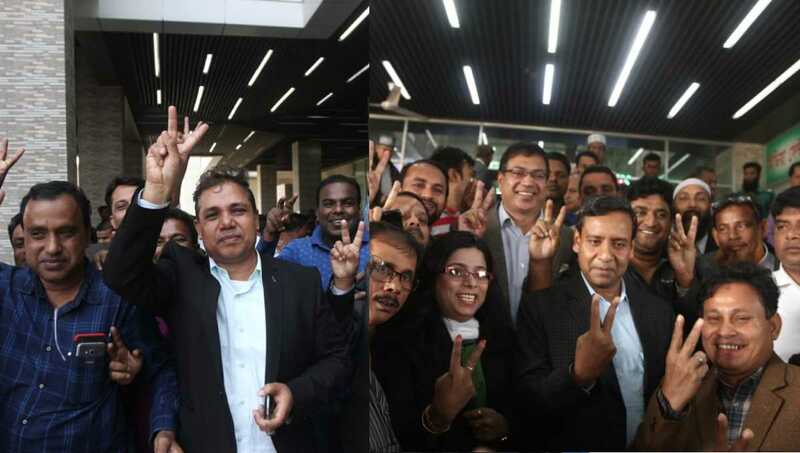 Dhaka, Dec 6 : The Election Commission on Thursday cleared the candidature of several BNP aspirants, including Golam Maula Rony of Patuakhali-3 and Morshed Milton of Bagura-7, to contest the 11th general election. The Election Commission, the appellate authority, cleared them off the rejection list during the first hours of hearing at Nirbachan Bhaban in the city on Thursday. Earlier, the EC started hearing on the petitions around 10 am and disposed of several petitions instantly.